NEW BRITAIN - The saying goes two are often better than one. That has certainly been the case this season for the Innovation boys basketball team. 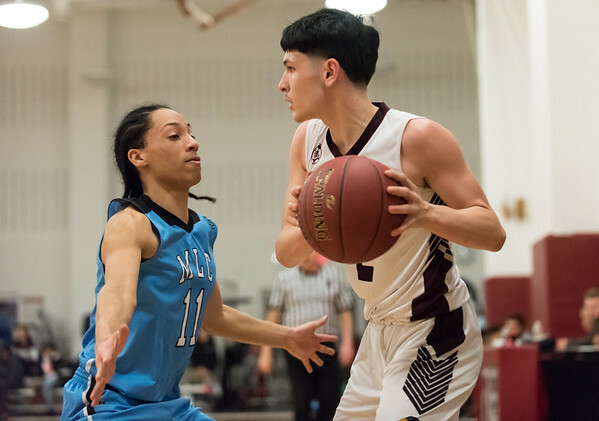 After going 8-47 in their first three years as a varsity program (first as Med-Ed Prep in 2015), the Ravens combined with Two Rivers Magnet High School after budget issues forced the Bloomfield-based school to close. More students means more athletes and more depth. And the results have followed. Last Wednesday, Innovation’s rout over Achievement First secured the program’s first postseason berth. Currently 9-5 on the season, the Ravens are just one more win from securing their first non-losing regular season and two wins away from their first winning one. That mindset has been one of the main reasons for the Ravens’ success thus far. The team leaders and therefore the players don’t care if one person scores all the points or if it is a collective team effort. As long as they secure a win, that is all that matters. It didn’t matter if they were from Innovation or Two Rivers, they reassured everyone they are there to win. There were already Innovation mainstays from seasons past, such as Linwood Hazlewood, Lenny Okonya and Ramiesh Boge. The additions of Malcolm Lewis and Carlos Gonzalez, both former Two Rivers players, have only helped. And while Lance and the team are happy with how their season is going, they’re not completely satisfied. At least, not just yet. After Friday night’s game against MLC, the Ravens still know there is work to be done. Against a team Innovation had beaten in their previous meeting by close to 30 points, the Ravens had to hold off a late charge. Performances like that are a reason for one of Lance’s other mottos, “you are only as good as the product you put on the floor.” And Innovation expects itself to play up to what it describes as its full potential every time it steps on the floor, no matter the opponent. So the Ravens are keeping their focus when they get into practice and in their next games - no matter what they have accomplished. At this point there is still more to do. Posted in New Britain Herald, Innovation on Sunday, 4 February 2018 23:01. Updated: Sunday, 4 February 2018 23:03.